Abu Ayyub al-Masri (/ˈɑːbuː ɑːˈjuːb ɑːl ˈmɑːsri/ ( listen) AH-boo ah-YOOB ahl MAHSS-ree; أبو أيّوب المصري, ʾAbū ʾAyyūb al-Maṣrī, translation: "Father of Ayyub the Egyptian"; 1967 – 18 April 2010), also known as Abu Hamza al-Muhajir ( pronunciation (help·info); أبو حمزة المهاجر ʾAbū Ḥamzah al-Muhāǧir, translation: "Father of Hamza the immigrant") and other aliases (see name), was the leader of Al-Qaeda in Iraq during the Iraqi insurgency, following the death of Abu Musab al-Zarqawi in June 2006. He was prime minister of the Islamic State of Iraq from 2009-2010. He was killed during a raid on his safehouse on 18 April 2010. Abu Ayyub al-Masri, leader of al-Qaeda in Iraq from 2006 to 2010. Born in Egypt, he joined the Muslim Brotherhood and, according to General Caldwell, joined Ayman al-Zawahiri's Egyptian Islamic Jihad in 1982, where he "worked with Zawahiri." Al-Masri went to Afghanistan in 1999, where he attended Osama bin Laden's al-Farouk camp, becoming an expert with explosives. al-Masri entered Yemen using a fake passport under the name "Yussef Haddad Labib" and taught in village schools. He married Hasna, a native of Yemen, in the capital Sanaa in 1998 and they had three children. Hasna was arrested in the same April 18 operation in the Lake Tharthar area, south of Baghdad, in which her husband was killed. "I only found out that he was Abu Ayyub al-Masri after the death of Abu Mussab al-Zarqawi," Hasna subsequently stated, referring to the Jordanian commander of Al-Qaeda in Iraq, who was killed in a 2006 US air raid and replaced by her husband. Hasna asserted that her husband had always been a "secretive character." After the American invasion of Afghanistan, al-Masri went to Iraq via the United Arab Emirates in 2002, according to the subsequent account given by his widow. He lived initially in Baghdad's Karrada, then in the Amiriya fainal,[check spelling] and then al-Jadida, where he took charge of al-Qaeda's operations in the southern part of the country. The United States military said that Masri "helped draw other insurgent groups into al-Qaeda’s fold." DefenseLINK News reported that Masri "helped establish the Baghdad cell of al-Qaeda in early 2003". Soon after, he "worked the ‘rat line’ down the Euphrates River Valley supplying suicide bombers via Syria." After the US-led invasion, the family left Baghdad for Diyala to the north. Hasna related "The two-storey house where we were was hit in a US air raid. Then, one of the men was killed but my husband and I were able to escape to Fallujah" [the Sunni Arab town west of Baghdad that was at the time a bastion of the anti-US insurgency]. al-Masri participated in the major 2004 battle of Fallujah. After US troops stormed the town in November 2004, the family moved again, this time to the town of Abu Ghraib, on the western outskirts of the capital. In 2007, al-Masri and his family moved to the Lake Tharthar area. "We were changing houses the whole time, right up to his death," claimed Hasna. A claim posted on an Islamic website said that Abu Hamza al-Muhajir personally killed two U.S. Army soldiers who disappeared after an ambush in Iraq on 16 June 2006, as a means of "making his presence felt." Their bodies were later found mutilated and booby-trapped in Yusufiyah, Iraq, on 19 June 2006. On 20 September 2006, Abu Hamza al-Muhajir claimed responsibility for personally killing Turkish hostage Murat Yuce, whose execution was captured in a video first released in August 2004. Murat Yuce was killed with three gunshot wounds to the head. He had been kidnapped in late July 2004, along with Turk co-worker Aytullah Gezmen, who was released in September 2004 after having declared his repentance for having worked for the Americans. Abu Ayyub al-Masri was on the list of persons wanted by the coalition forces and Iraqi authorities in 2005, or possibly earlier. The Mujahideen Shura Council, which included Al-Qaeda in Iraq and other Iraqi insurgent groups, named Abu Hamza al-Muhajir as their new emir in June 2006. However, National Security Advisor Stephen Hadley said, "It’s not clear at this point who is in (control). We’ve seen a number of different reports … In our view it’s not yet settled." After Abu Omar al-Baghdadi's alleged capture by the American forces on 7 March 2007, the media started reporting about al-Masri's standing in the insurgency, and a video tape was released to the media in which al-Masri proclaims al-Baghdadi "the ruler of believers", with Iraqi Qaeda fighters under his command. al-Masri, as Abu Hamza al-Muhajir, was denoted as "al-Zarqawi's successor" by the Coalition and the Bush administration posted a bounty on him, later raised to $25 million. In 2008, the bounty was reduced to $100,000, with Central Command spokesman Jamie Graybeal stating that "The current assessment, based on a number of factors, shows that [al-Masri] is not ... an effective leader of al Qaeda in Iraq as he was last year," although, as the spokesman stated, "for security reasons," he couldn't go into detail about the assessment. The reduction of reward money knocked al-Masri off the U.S. State Department "Rewards for Justice" program list and placed him on a Department of Defense list for people with lower bounties. 'Abu Hamza al-Muhajir' was erroneously reported killed during a US raid in Haditha in October 2006, and in an "internal battle between militants" in May 2007. The person killed in the latter report was actually Muharib Abdul Latif al-Jubouri, a senior member of Al-Qaida in Iraq and the "public relations minister" of al-Baghdadi's shadow cabinet. On April 18, 2010, Abu Ayyub al-Masri was killed in a joint American and Iraqi operation near Tikrit. The coalition forces believed al-Masri to be wearing a suicide vest and proceeded cautiously. After the lengthy exchange of fire and bombing of the house, the Iraqi troops stormed inside and found two women still alive, one of whom was al-Masri's wife, identified as al-Masri, Abu Omar al-Baghdadi, and al-Baghdadi's son. A suicide vest was found on al-Masri's corpse, according to the Iraqi Army. Iraqi Prime Minister Nouri al-Maliki announced the killings of Abu Omar al-Baghdadi and Abu Ayyub al-Masri at a news conference in Baghdad and showed reporters photographs of their corpses. "The attack was carried out by ground forces which surrounded the house, and also through the use of missiles," Maliki said. "During the operation computers were seized with e-mails and messages to the two biggest terrorists, Osama bin Laden and [his deputy] Ayman al-Zawahiri," Maliki added. U.S. forces commander Gen. Raymond Odierno praised the operation. "The death of these terrorists is potentially the most significant blow to al-Qaeda in Iraq since the beginning of the insurgency," he said. "There is still work to do but this is a significant step forward in ridding Iraq of terrorists." On April 25, 2010, a four-page announcement by the Islamic State of Iraq organisation was posted on a militant website early Sunday confirming the deaths of al-Masri and al-Baghdadi. The ISI's shariah minister, Abu al-Walid Abd al-Wahhab al-Mashadani, stated in the announcement that the two leaders were attending a meeting when "enemy forces" engaged them in battle and launched an airstrike on their location. The announcement, in an apparent reference to the previous Friday's extensive bomb attacks, claimed that the "Crusaders and the Shi'ites will exploit the incident to improve the image of Iraqi security services and give the enemy alliance an 'illusory' victory after the mass-casualty incidents carried out by the ISI in Baghdad." US Vice-President Joe Biden stated that the deaths of the top two al-Qaeda figures in Iraq are "potentially devastating" blows to the terror network there and proof that Iraqi security forces are gaining ground. 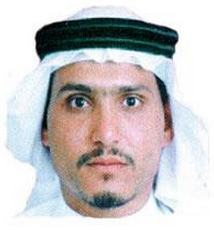 On May 14, 2010, al-Nasser Lideen Illah Abu Suleiman (الناصر لدين الله أبو سليمان an-Nāṣir li-Dīn-illāh ʾAbū Sulaymān) replaced al-Masri as war minister of the Islamic State of Iraq. In a November 2010 interview by Kuwaiti news outlet al-Jaridah with Ibrahim al-Banna, a senior leader of Al-Qaeda in the Arabian Peninsula, who met with Abu Hamza while he was in Yemen, claimed that Abu Hamza's real name was Abd-al-Mun’im al-Badawi (عبد المنعم البدوي ʿAbd ul-Munʿim al-Badawī ), which supported an earlier 2009 al-Qaeda statement describing the makeup of a new "War Cabinet." ^ Youssef Aboul-Enein, Militant Islamist Ideology: Understanding the Global Threat, Naval Institute Press, 2011, p. 228. ^ Wanted Poster on al-Masri Archived October 5, 2006, at the Wayback Machine (in Arabic), US Department of State. ^ a b Wanted Poster on al-Masri Archived February 13, 2007, at the Wayback Machine, US Department of State. ^ "Abu Hamza al-Muhajir, Zarqawi's Mysterious Successor (aka Abu Ayub al-Masri)". Council on Foreign Relations. 13 June 2006. Archived from the original on October 9, 2011. Retrieved 9 October 2011. ^ "Declaration of the Second Cabinet Reshuffle for the Islamic State of Iraq". Web Archive. ^ "2 Most Wanted Al Qaeda Leaders in Iraq Killed by U.S., Iraqi Forces" FoxNews, 19 April 2010. ^ "US : Al-Qaida in Iraq warlord slain" Archived 2016-11-13 at the Wayback Machine MSNBC, 20 April 2010. ^ "Al-Qaeda in Iraq says leaders dead" al-Jazeera, 25 April 2010. ^ "Iraqi al-Qaeda leaders 'killed'". BBC News. 19 April 2010. ^ "SITE: Qaeda in Iraq names new 'war minister1" Archived 2017-11-11 at the Wayback Machine MiddleEastOnline, 14 May 2010.